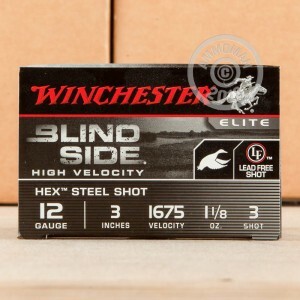 Winchester's Blind Side line of shotshells represents the current pinnacle of waterfowl shooting technology. 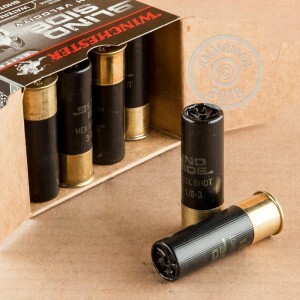 These 3" shells come packed with 1-1/8 ounces of hex-cut steel shot which is proven to deliver up to 3 times the impact of standard steel shot. The shot is backed by a diamond cut wad which opens in-flight and delivers the most consistent, dense pattern possible to put down birds effectively. 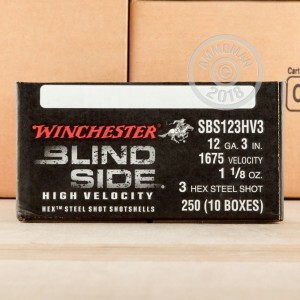 Hunters who demand fast shot delivery out of their fowling pieces will be delighted with Blind Side velocity of 1675 feet-per-second in 12 gauge. Unlike similar high velocity shells, these rounds have relatively low felt recoil due to Winchester's hinged wad design which flexes during firing to dampen impulse. In addition, Winchester's DryLok Super Steel System seals the shell and provides unparalleled water resistance for those early mornings spent deep in the marsh. Winchester is a long-trusted name in the American shooting industry with almost 150 years of experience. Their adherence to classic designs combined with their drive for innovations results in game-dropping, title-winning performance for all disciplines of modern shooters.